Take Me Out To The Ball Game…Take me Out To The “sold out” Crowds on Saturday, March 14th to meet the winner of The Baltimore Orioles and “Visit Sarasota County” Spring Training Kids Contest. 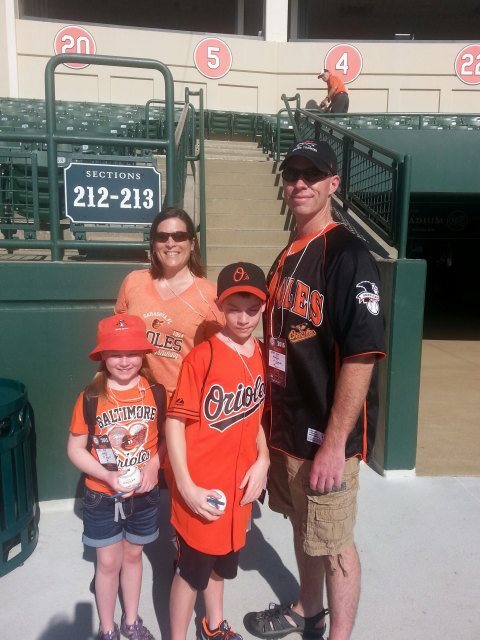 Aiden Bradley, an ambitious young 10 year old from Perry Hall, Maryland and his family were treated to a memorable trip to Sarasota to see his favorite team, the Orioles, play a game at the Ed Smith Stadium. The contest ran in the Orioles Kids Magazine and asked children to submit a one-page statement on why they should be selected for the trip. It was evident from meeting him, that Aiden loves the game of baseball and was eager to win. The contest generated nearly 50 entries submitted by children from age 3 to 13 and further promoted the strong partnership between Sarasota and the Baltimore Orioles. The Orioles have been a part of the community for more than 2 decades and the Ed Smith Stadium is another “jewel’ in Sarasota. With the over 30 million dollar renovation, the stadium has become one of the minor leagues finest training centers and yet another reason to visit Sarasota as it is a year-round must-experience destination. Winner of Orioles Kids Magazine to be at Spring Training Game Saturday, March 14, 2015; 10:30-11:15 a.m.
What: The winner of Visit Sarasota County and the Orioles Kids Magazine’s contest to bring a child to spring training will be on the field, Aiden Bradley, 10. When: Saturday, March 14, 2014, 10:30 a.m.-11:15 a.m. Located on Southwest Florida’s Gulf Coast, Sarasota County offers a vibrant arts and cultural scene, a diverse array of culinary experiences and a variety of opportunities to take advantage of the clear waters and the great outdoors. Sarasota County provides the quintessential, laid-back beach getaway with numerous sprawling, white-sand beaches, including Siesta Key Beach, named “America’s Best Beach” in 2011 by Stephen Leatherman, aka, Dr. Beach. Dubbed “Home of the American Circus,” Sarasota County served as the headquarters for the Ringling Brothers, Barnum & Bailey Circus for 75 years, and visitors can experience its unique circus heritage first-hand by following the circus trail or catching a performance by one of two local circus companies. For more information on visiting Sarasota County, visit www.visitsarasota.org or call (800) 522-9799. Remember to add your events to Visit Sarasota County’s Event Calendar! Plan your day and nights using Visit Sarasota County’s Events Calendar!